Model Boat Plans – Where to Find Quality Blueprints. Good model boat plans can be hard to find. I have listed maritime books, vendors, websites and model boat magazines that include line plans, drawings and blueprints for model boat and ship building. Model boat plans are harder to come by than you would think. In all my years of model boat building I've never stopped looking for sources of decent plans. I’ve been happily surprised a number of times and disappointed at least just as often. 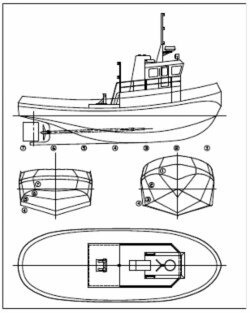 Example of a simple model tug boat plan. In an effort to help other hobbyists I've decided to list sources that I think could be useful. How useful will depend on your interest as most sources are pretty specific to an era or narrow subject - sometimes just a single ship. I've tried to add comments to help your determine if a book or plan is worth your time and money. First, some shameless self-promotion. I'm now offering plans for sale in the store section (use link above). The plans are either CAD generated in PDF format or scanned and carefully edited to enhance the print quality. In either case they are offered at very competitive prices. The best part is that you download them directly onto your computer and print them at home or at your local copy store. Easy as pie as they say. Here is more information on printing PDF plans. This page is a list of websites that offer free model boat and ship plans. I’ve made no effort in distinguishing quality of the plans or difficulty in building a model from them. Some of these plans show model construction, which should make it easier for a beginner to complete. To qualify to this list the ship plan must have all information necessary to finish at least a hull, as best I can tell. Please Remember: Beggars can’t be choosers, so be grateful these webmasters have made these plans available for free. On the other hand, some sites use "free" to draw in traffic, which is pretty cheesy in my opinion. The listed sources are free and, from what I can tell, offer a good product. All the maritime books listed has been selected with model boat builders in mind. Many has useful ship plans and other illustrations and photographs that make up great references. Books with plans can be used directly or to draw up your own plans. Be warned though, books in general are relatively small and can pose problems when enlarging or scanning. Inclusion on this list has more to do with the fact that hull lines are present – not the quality of the print. Speaking of quality of print – many books have been reprinted in several editions sometimes over centuries, as with the Architectura Navalis Mercatoria. It is not uncommon that later editions have deteriorated print quality and in some cases the size of the book itself has gotten smaller. So as a general rule, if there is an opportunity, I’d advise you get the older edition even if the condition of the book may be less appealing. These are books geared to builders, usually with "how-to" instructions and often plans. The model boat plans that come this way are either printed in the book itself or as a separate attachment. Having the plan separate is best in my opinion. Unfortunately, they are often printed on poor quality paper and are often folded. Sometimes you can save big money by buying these books second-hand. Be warned though, in the case of plans being provided as a separate attachment, as they may go missing. All model boat plans were not created equal. The print may be fuzzy or too light to be legible, incomplete, lines not being true. Sometimes you think you are getting a plan for a historic ship that, as it turned out, never existed! In a nutshell, it is all too easy to be disappointed after spending $50 to $100 on a ship plan. Find out how you can minimize the risk of getting disappointed. Some magazines include free plans in some editions. This is hit and miss. Don’t subscribe to a magazine hoping you’ll get a free plan you can build from. If you do, it may take years before one you like will show up. Magazines can be good for inspiration, reviews and to gain from other people’s experience. The magazines I've included come with model boat plans on occasion.